In only 2 days, we’ll be kicking off a whole month centered around glass recycling. 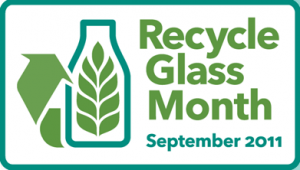 Started and coordinated by the Glass Packaging Institute, Recycle Glass Month will be in its fourth year with events around the country that bring together glass suppliers, manufacturers, recyclers and you. Well we’re getting involved in our own way. Each weekly blog in September will focus on the how, what and why, along with the the benefits of recycled glass. We’re announcing a Glass Challenge on Facebook and Twitter on September 1. We’re going to challenge you to recycle more glass in your neighborhood or community and every single creative idea will be rewarded. Our glass bottles are made from a minimum of 75% post-consumer recycled glass so we’re going to run the numbers and share how much energy, material, and resource we’ve saved together. So, won’t you join us in September for Recycle Glass Month?